This season has become the very definition of Jekyll and Hyde for Motherwell, who face Hearts this Sunday after an incredible run of five successive league wins, writes Craig Goldthorp. Going into the eagerly anticipated encounter against the Jambos, seventh placed Motherwell find themselves just four points behind sixth placed St Johnstone with still eight games to go until the split. With so much optimism around Motherwell at the moment, with young stars Jake Hastie, Allan Campbell and David Turnbull supplying a revitalised Curtis Main and new winger Gboly Ariyibi continuing to impress as part of an exciting 4-3-3 formation, it’s hard to believe that the widespread criticism of Motherwell’s previous ‘agricultural’ style was actually being justifiably written about as recently as two months ago. Yes, it is a fact – and manager Stephen Robinson and his players admitted as much in post match interviews earlier in the season – some of the games served up earlier in this campaign were about as easy on the eye as a severe case of glaucoma. Long balls, aerial battles and midfield scraps were rife as part of a 3-5-2 system which had been successful last season in getting ’Well a seventh place finish and a spot in two cup finals. But even the most sycophantic Motherwell FC observer would have to admit that watching these games was at times, a million miles away from being enjoyable. So, credit where credit’s due, boss Robbo and the powers that be made a conscious effort to change the playing style and personnel drastically and they have been rewarded in spectacular style. Fans are now looking forward to going to matches again and believe that this team is actually going places. From being 13 points behind St Johnstone only six games ago, Motherwell have closed within four and look a good bet to overtake their Perth rivals who still have to visit Fir Park on league duty on March 30. 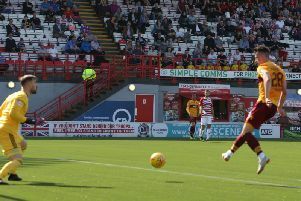 Given the fact that Motherwell’s points tally in the last six games (15) is only matched by leaders Celtic, it is of great frustration to many of a claret and amber persuasion that their favourites exited the William Hill Scottish Cup in a shock 2-1 home reverse to Championship Ross County on January 19. Had they got through that one, they would have genuine belief – depending on the draw – about reaching another final this time.